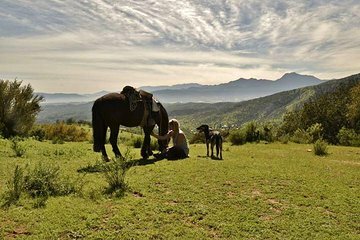 Ride a Criollo horse through the gorgeous countryside near Valparaiso on a full-day riding trip that includes a traditional, open-air barbecue lunch. With roughly six hours of time in the saddle, you’ll ride to great views across Quebrada Escobares, then pause for sausages, grilled vegetables, homemade bread, and Chilean wine. This trip is limited to eight people for personal service from the trail guides, with pickup and drop-off at a metro station that's accessible from Valparaiso. Take the Metro at Plaza Sotomayor Valparaiso, Pick up at Metro Station Peñablanca or directly at Campesano Ranch - Quebrada Escobares. Please contact the day before the activity via Viator or WhatsApp +56966785644 to confirm and talk meeting point details!